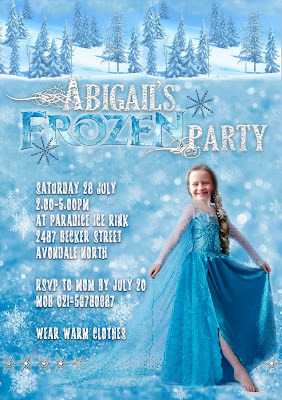 Here at last is the "How-to" post for Miss Fab's Snowflake-themed Ice Skating party. 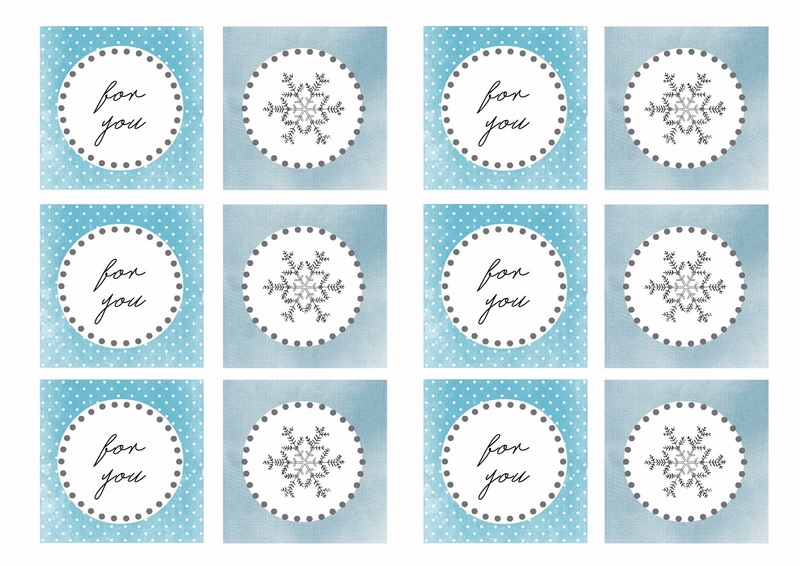 Included are some free printables I've created which you can simply save, print and use for your Snowflake/Winter Wonderland/Ice Skating party. I tried to keep all the food to the blue-and-white theme, with snowflakes on top, making a huge batch of blue buttercream frosting (it looks a bit turquoise in the photos, sadly) which was used on lots of things. 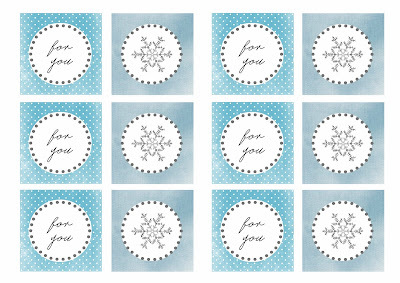 I cut out a snowflakes from rolled out white fondant, using a snowflake plunger ejector cutter. With the cutter, it was really really easy to theme the cupcakes, the birthday cake and even some cookies. 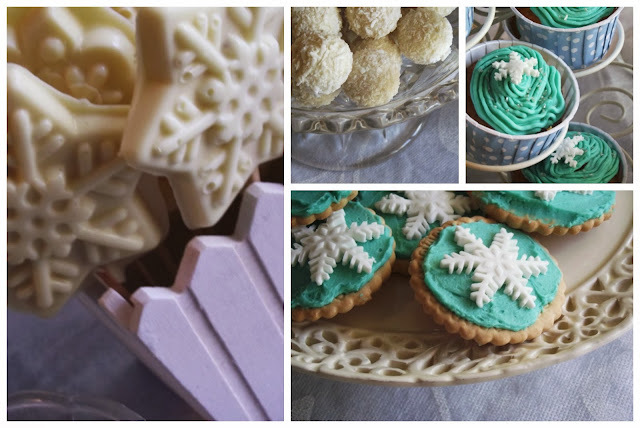 By using leftover buttercream on a packet of plain round wine bikkies and then topping each one with a snowflake, we instantly went from boring biscuits to snowflake heaven. We melted white chocolate and poured it into snowflake moulds to make white snowflake "lollipops". 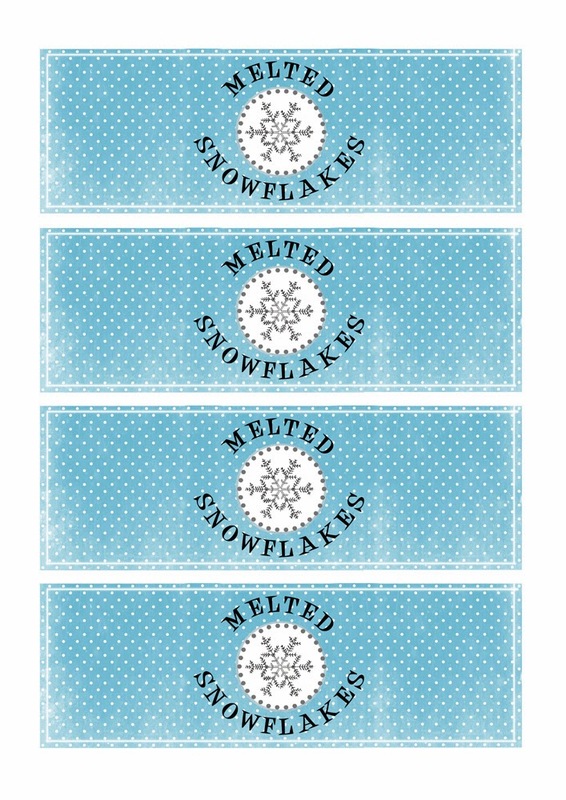 I found some moulds on trademe, but you can also find lots of snowflake-themed products here on Kiwicakes. 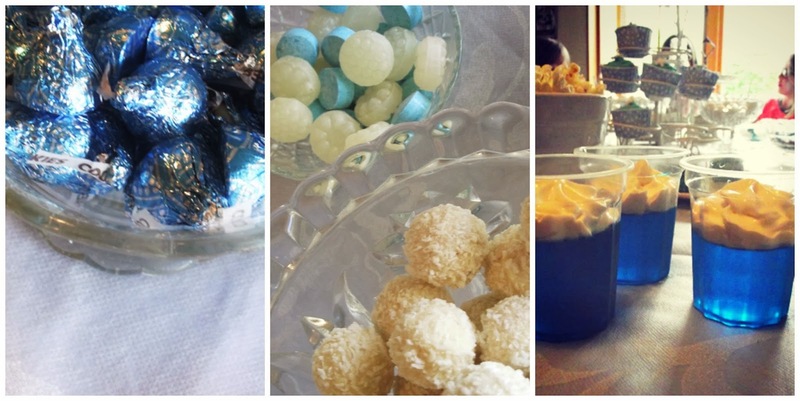 Ferrero Rocher "Rafaello" (white chocolate snowballs) were another easy themed treat... and so yum. 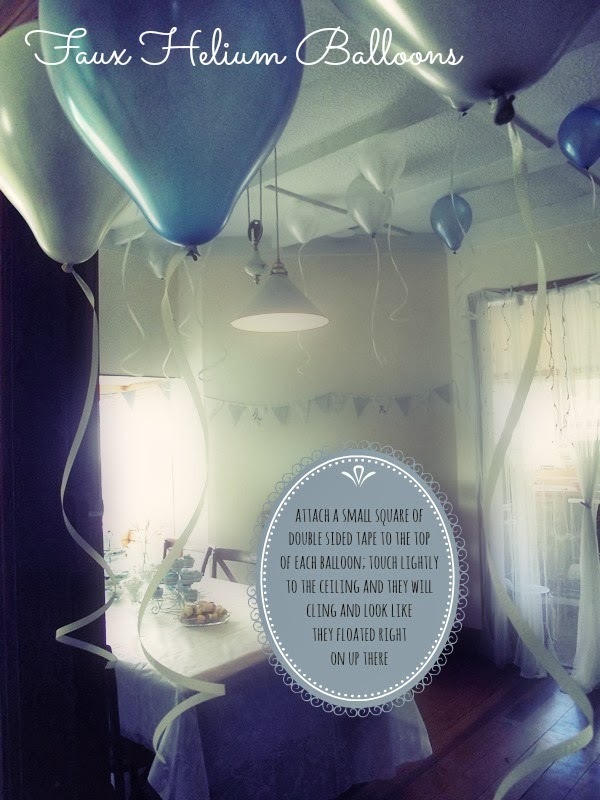 I displayed everything on white china or cut glass plates and bowls; other treats included blue and white sweets, blue Hershey kisses, fruit kebabs (green grapes, coconut-dipped banana and white marshmallow) and blueberry jelly in individual cups. And popcorn. Good ole plain white popcorn. Blue lamingtons were easy (if a little messy) to make. Cut up a slab of shop-bought spongecake; make some basic icing (icing sugar and water, blue colouring, vanilla, nice and runny). Cut the spongecake into squares, dip each square into the runny icing, then roll in dessicated coconut. Voila - blue lamingtons. 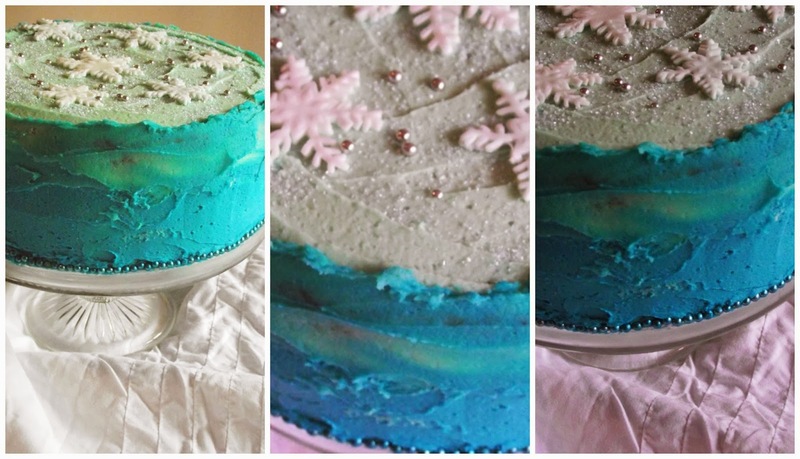 The cake was blue on the inside; I created the swirly blue icing on the sides of the cake, by splitting a batch of buttercream in half, adding a generous amount of blue colouring to one lot, and a teensy dot of colour to the other. 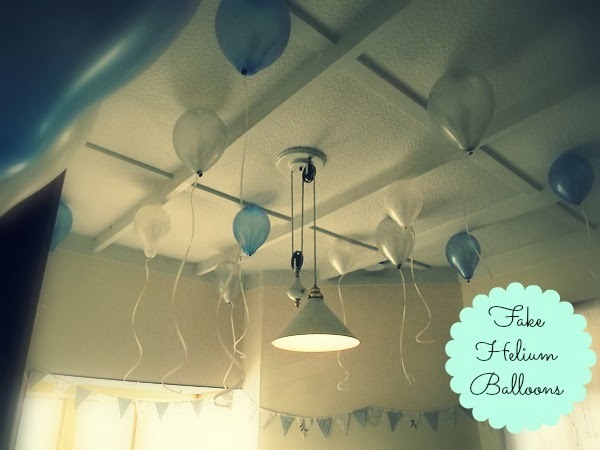 Start at the top with the pale blue, then go from the bottom with the deeper blue. 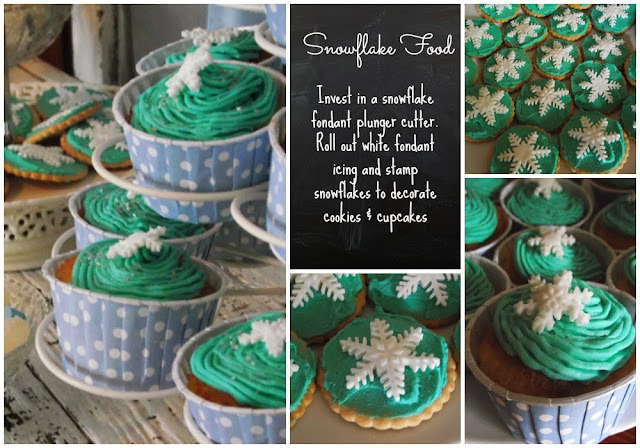 Use a butterknife to roughly swirl the colour together where it meets in the middle... and top with snowflakes, granulated sugar and silver/blue cachous. 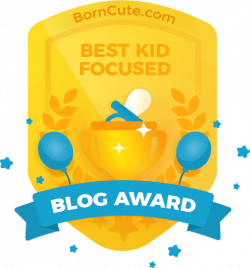 (It looks much fancier than it is. 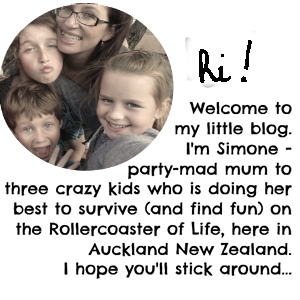 this was very simple to do). 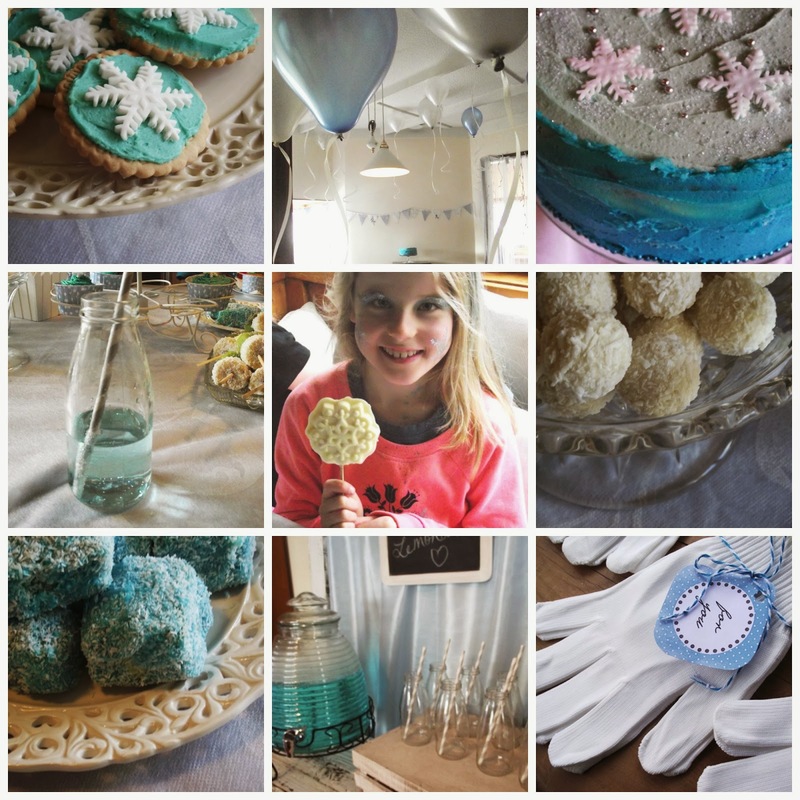 FOR THE TEA PARTY: We brought out our trusty Lemonade Stand (tutorial on how to build it here), and decked it out in blue satin and bunting. 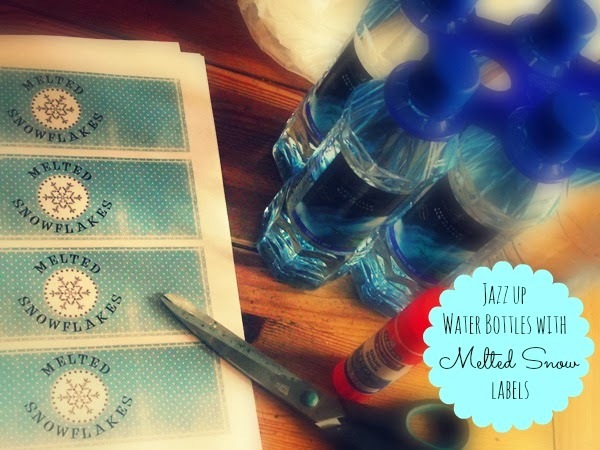 I got some of those cute glass bottles and silver striped paper straws from PopRoc Parties; I also invested in a glass drinks dispenser. 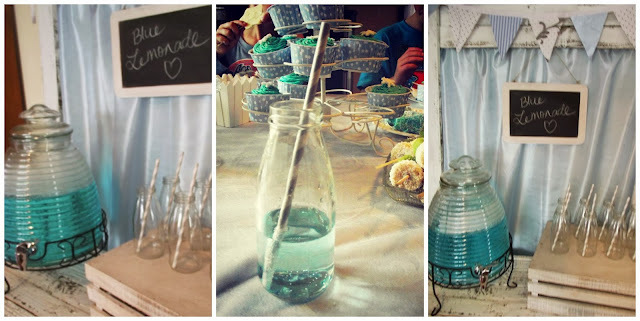 The drink itself is very easy - a couple of litres of homebrand lemonade (soda) with a dot of blue food colouring, dipped in with a straw. Simple but effective (and pretty). FOR THE ICE SKATING: Skating is thirsty work, so some party-themed water bottles were in order. 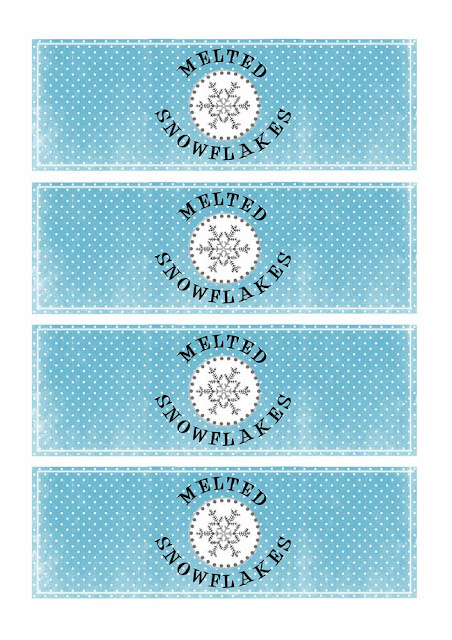 I printed these labels out on A4 paper, trimmed them, removed the labels on the pack of water bottles I'd bought, and then applied the new "Melted Snowflakes" label with a glue stick. Too easy. Right-click to save to your computer, then print and use. 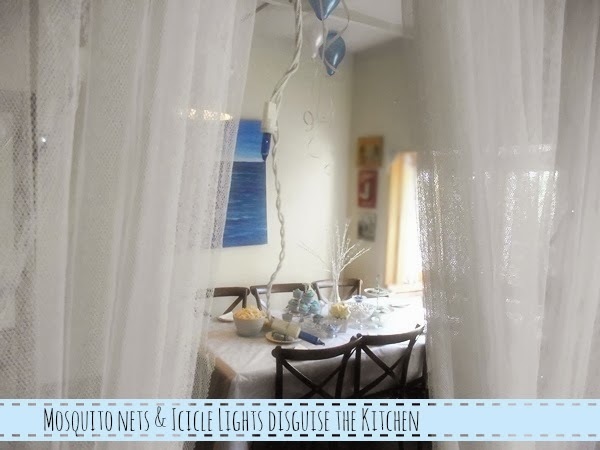 We went all out for this one with blue and white, making use of mosquito nets, Christmas icicle lights, loads of blue-and-white no-sew bunting and a clever trick with balloons, for a magical Winter Wonderland tea party atmosphere. 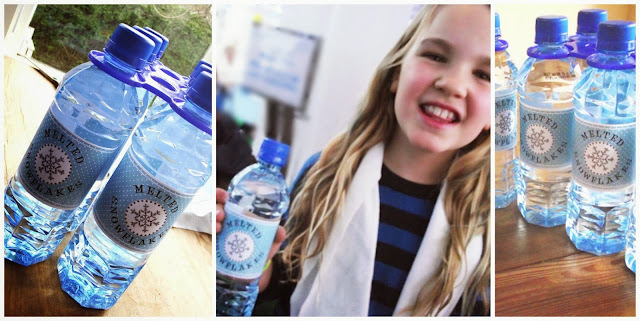 I'm not a fan of party bags filled with plastic rubbish, but I do usually like to be clever and find a way to send my little guests home with something to keep. For this party, we went practical and cute, with a little set of white gloves and scarf for each guest to take with them ice skating. 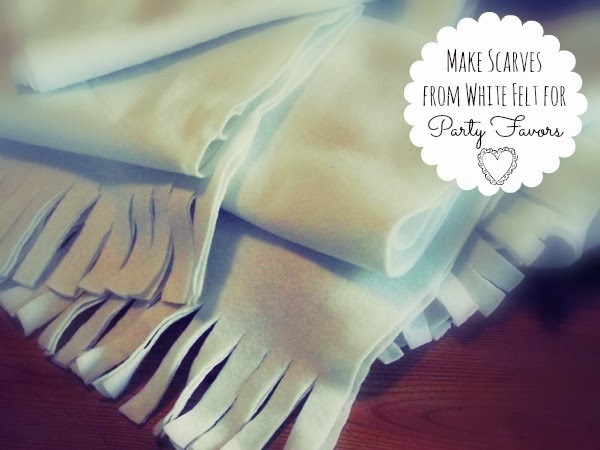 The no-sew scarves were made from soft white felt, by cutting a long strip approximately 20cm wide and 1.5. metres long, then snipping "fringes" at each end. 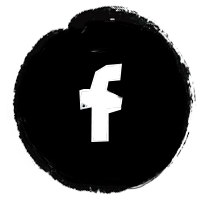 Felt can be found for around $3 metre, making this a very cost-effective gift. 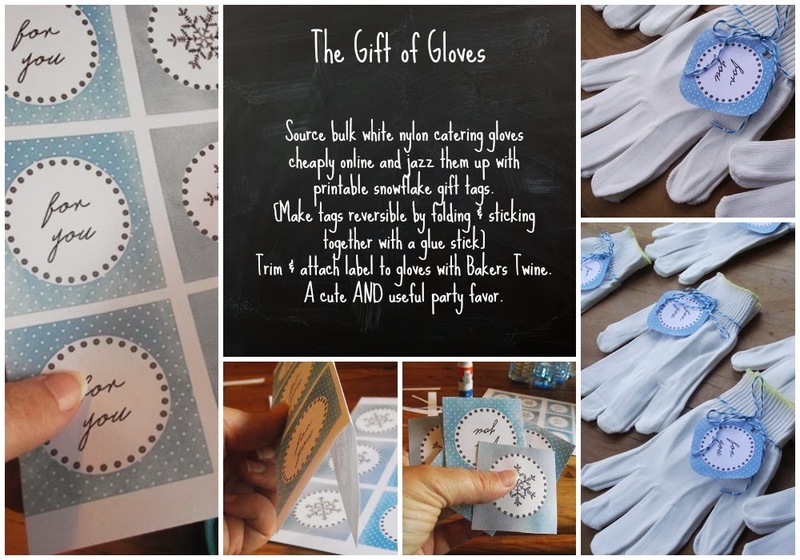 (I had glitter and glue guns available for the guests to decorate and personalise their scarves, as a pre-tea party activity). 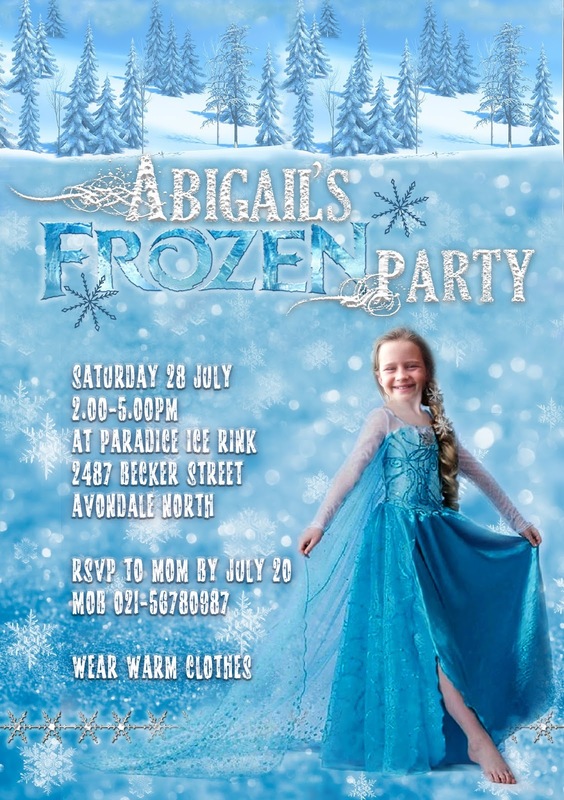 A winter-themed Frozen Party invitation. 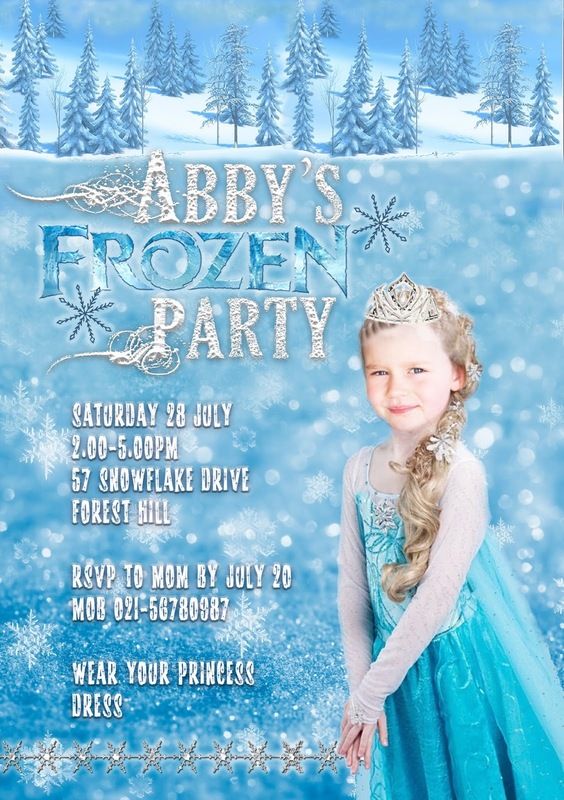 This invitation features the birthday child as Queen Elsa in two different styles. I will Personalise this invitation with your party details and your child's photo, turning her into Queen Elsa from "Frozen".